It only takes one session with Jessica to understand why she is successful in treating our patients. She is passionate about her line of work and in helping our patients improve. 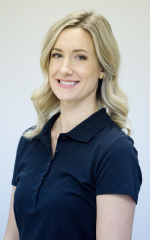 Through post-graduate training and experience, Jessica has become an expert in identifying and treating altered movement patterns that negatively impact the body, causing pain and decreased performance. She combines Instrument Assisted Tissue Mobilization techniques with various other manual techniques to enhance the effects of corrective exercises. Jessica reinforces to our patients that proper movement patterns are essential for healing, reducing the risk of future injury and in allowing them to reach optimal performance levels. She also utilizes RockTape application, electrical muscular stimulation therapy, ultrasound therapy, and spinal decompression to enhance treatments. Jessica became a physical therapist to help people move better without pain. She attended Mount St. Joseph University to earn a Master of Physical Therapy, graduating in 2005. Since then she has worked at Barnes-Jewish Hospital in St. Louis, Missouri where her husband Mark attended chiropractic college. She also worked at Shriners Hospitals for Children – Cincinnati, in the pediatric burn care unit for five years. After taking a break due to the birth of their second child, Jessica returned to work by joining the ProWellness Chiropractic and Rehab team. She likes seeing our patients’ quality of life improve every day and cares for all ages, from pediatrics to geriatrics. Find out what you’re capable of with our natural healing solutions. Book your time with us today!